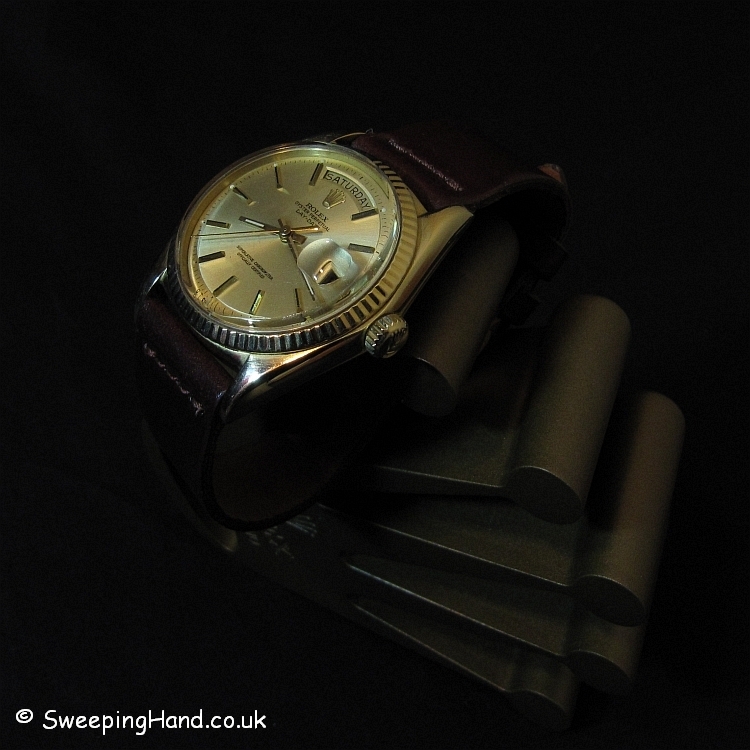 18k Gold Vintage Rolex Day-Date For Sale from 1972 - Bargain! Now this is a real bargain for solid gold 18k vintage Rolex Day Date. 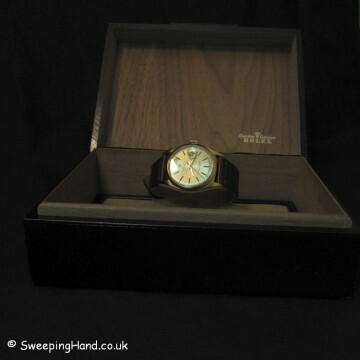 If you are 40 this year then this has to be the ultimate watch present! The solid gold flagship Rolex Date Date model has always been popular and never more so then now with gold prices going through the roof. This is a beautiful 3.0m example from 1972 and has to be one of the best priced available anywhere. Solid 18ct gold case in very nice clean condition with no noticeable marks or dings. 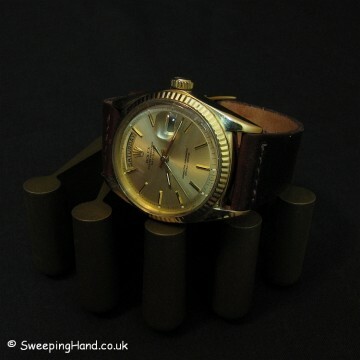 Gold baton stepped dial with all tritium plots in place and matching tritium hands. 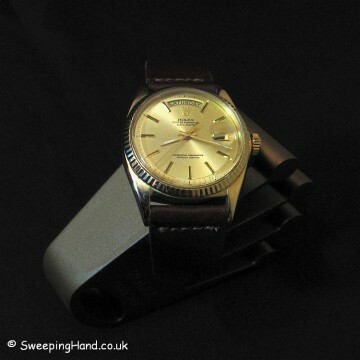 Original gold twinlock crown and solid gold fluted bezel. Automatic chronometer movement with single quick set for day and date and 3 service inscriptions inside case. 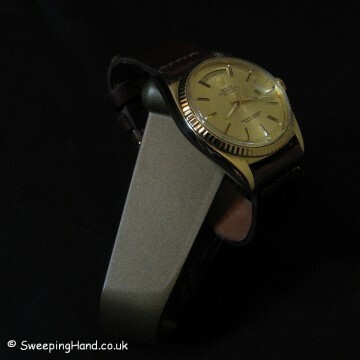 Comes on a new Horween genuine Shell Cordovan leather strap. Dial & Hands: Gold baton stepped dial with all tritium plots in place and matching tritium hands. 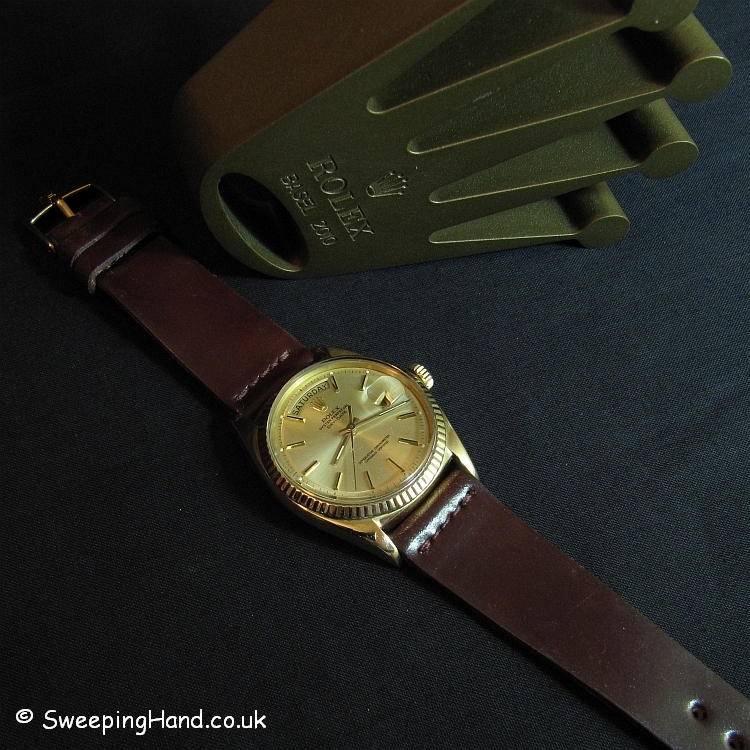 Case & Caseback: Solid gold 18k Rolex case with 18k caseback correctly stamped with model, serial number and gold insignia. Correct gold stamps to lower lugs and serial numbers clearly visible between them. 18k gold fluted bezel. Bracelet: Comes on a new dark brown Horween genuine Shell Cordovan leather strap. Movement: Automatic chronometer single quick set movement keeping very good time. What size is this please ? 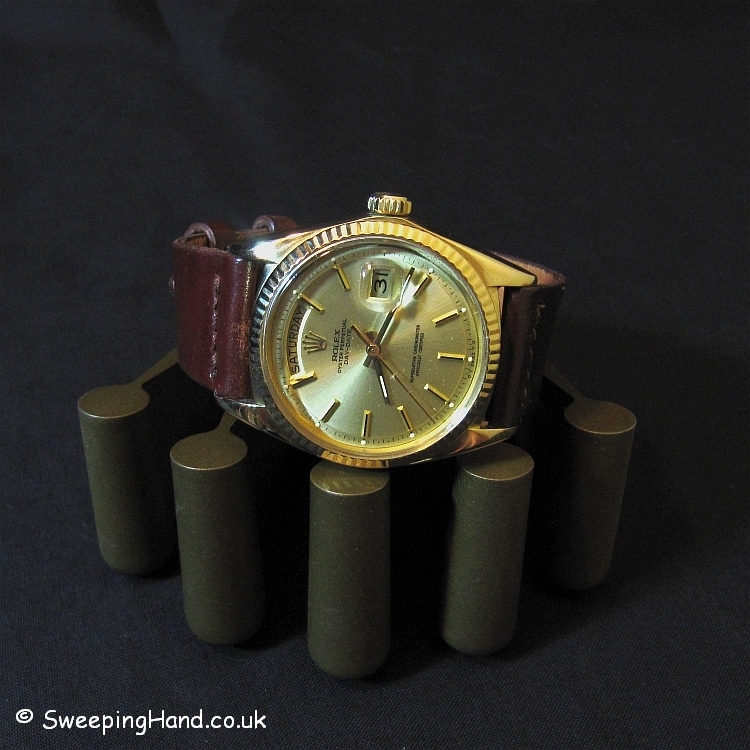 Hi Justin – it is 36mm across with 20mm lug width. I cannot believe that this is still available at that price!! I only wish I had the monies to buy that daydate, but following the purchase and RSC restoration of my 1675 I’m jolly well skint!!! Happens to us all Paul I’m afraid! Been there many times when something comes up!